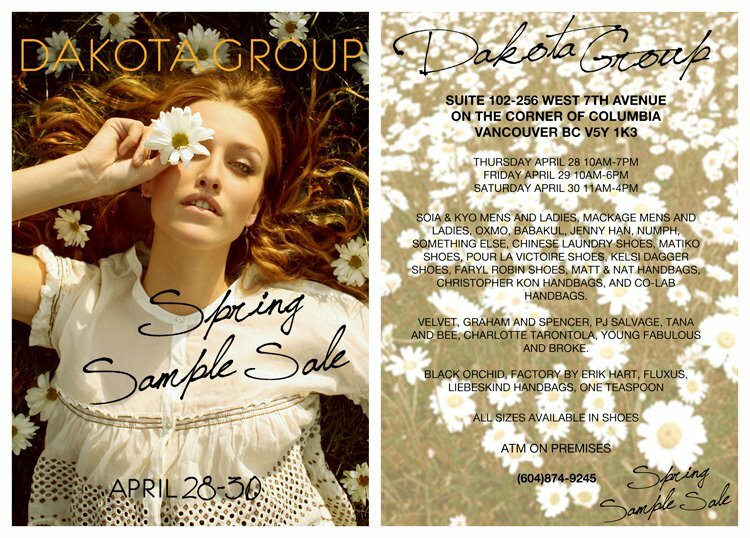 Win a chance to pre-shop the Dakota Group sample sale! It's that time of year again! 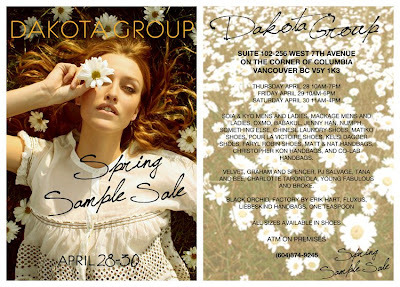 The Dakota Group sample sale happens twice a year and is always one of my favourites because of the Pour La Victoire, Kelsi Dagger and Matiko shoes at incredible prices. If you're a shoe lover like me, you're in luck. According to the organizers, "this sale is all about SHOES! Prices will be wholesale or cheaper (that's 50% off retail prices minimum). Brands include Matiko, Chinese Laundry, Pour La Victoire, Jenny Han, Kelsi Dagger, Faryl Robin, Matt & Nat, Factory by Erik Hart, FluXus, Something Else, One Teaspoon and more." For all the details, refer to the flyer above. The Dakota Group is offering one lucky Solo Lisa reader the chance to shop the sale before it's open to the public. This means you get the best selection before anyone else. To be eligible, you must be a Lower Mainland resident. Simply leave a comment on this post telling me which Dakota Group shoe label you're a fan of before Friday April 22nd, 12pm Pacific time. (That's only 2 days from now, so you should enter asap.) The winner will be chosen randomly. Good luck! When they say all about shoes, does that still mean 90% sample shoes i.e. size 6's? Would love to check this out if I'm back from school by then! I was a big fan of Jenny Han last time and also want to check out the Pour La Victoire shoes! I'm a really big fan of Kelsi Dagger shoes..they are always so stylish! ohhh how fun, I love love sample sales cuz they're cheaper in price for the same quality, have fun! @herwaisechoice Brands all offer their samples in different sizes which are commonly 6 or 7. Dakota Group, being the largest western wholesaler buys stock in certain their retail accounts meaning full or close to full size runs of select styles. I am a 7/8 and my shoe collection has multiplied thanks to Matiko, Kelsi Dagger, PLV & Faryl Robin samples found at DKG sales. At the last 3 sales, I have friends who are sized 5-10 walk away with great heels, sandals and boots. I hope that helps! I love Matiko! Every girl needs a good wedge with great quality leather made into a fierce (yes I said fierce)shoe! The shoes! Especially Jenny Han. So much thanks for offering this. My fave is Chinese laundry. Pour La Victoire all the way. Mmm pretty. I missed out on my chance to buy a pair of Pour La Victoire shoes - I won't let that happen again!